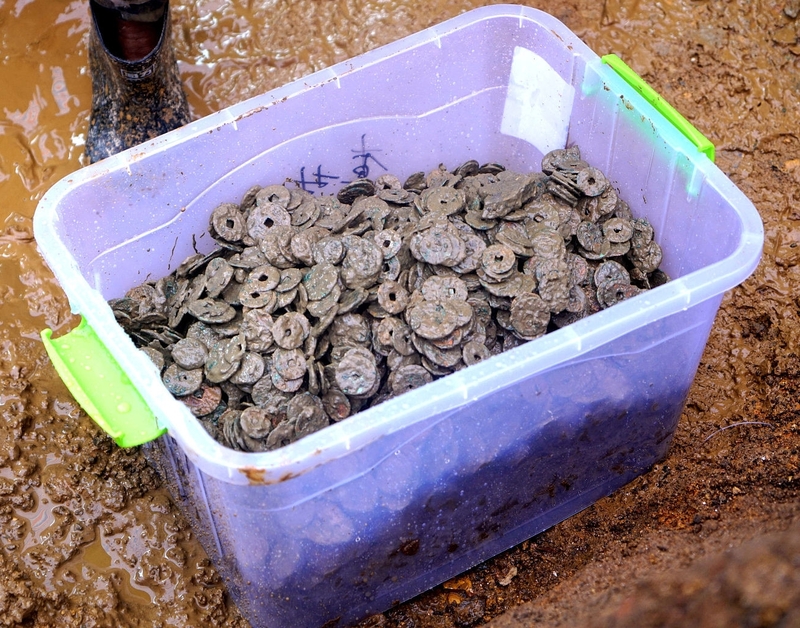 On October 13th, 2017, a massive cache of an estimated 300,000 copper coins for a total weight of 5.6 metric tons were discovered during construction work on the foundations of an old house in Chalian Village, near Jingdezhen in East China’s Jiangxi province. They are wén coins from the Song Dynasty (960–1279). Archaeologists from the Ceramics Archaeology Institute excavated the site starting October 22nd. The property is 100 square meters in area and is surrounded by village houses. After the coins were discovered, word of the find spread like wildfire. There was intense interest from the locals who wanted to dig up some buried treasure even though experts noted the coppers have little monetary value. Their worth is not in conversion to modern currency via black market sales, but rather in their historical significance. It is known that the coins date from the time of the Song dynasty (960-1279). The dynasty relocated its capital to Lin’an (Hangzhou today) after the city of Kaifeng was lost to the Jurchen Jin in 1127. Lin’an is near where the coins were found. The problem is that there is no local source of copper, which quickly led what was then the Southern Song dynasty to produce lower quality coins than those issued by the Northern Song dynasty. This also led to the emergence of paper money as copper cash coins became scarce. Iron coins were issued, but due to corrosion and manufacturing problems were never popular. Some numismatists have referred to this as the Qian Huang or “currency famine” for the Southern Song dynasty. The southern government cut military wages in half by 1161 due to a shortage of wen coins. In 1170 Huizi paper money became a permanent fixture since it was mandated half of all taxes be paid with this form of currency. This resulted in increased demand for the notes as well as for the increasingly scarce bronze coinage. Inflation eventually led to the use of small coin tallies called Qian Pai. Nonetheless, as soon as the government archaeologists left, villagers returned to the site with their digging implements to help themselves to any loot they might have missed. Individuals who did manage to remove coins from the site before and after the official excavation were persuaded to hand them over after being told that they were breaking cultural heritage laws by keeping the objects. Local folklore has it that the coin hoard was the treasure of a landlord who buried it under the foundations of his home 1,000 years ago. There is no evidence of this being true. Of the three filled cellars unearthed during the excavation, two were filled with coins and one with assorted debris. 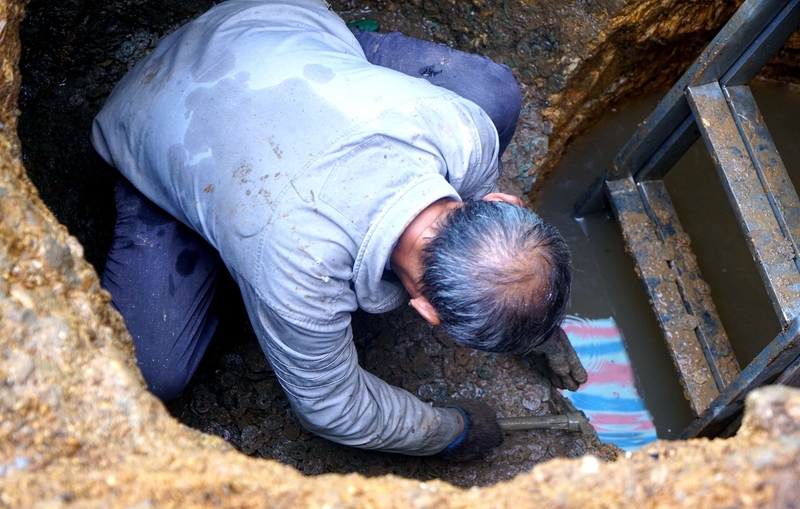 The fill in the third cellar included some dateable materials placing it in the Yuan Dynasty period. The story of the landlord puts him in the Ming Dynasty. Besides, it’s highly unlikely that a landlord, tradesman or any one individual would have had access to such a huge cash reserve, and even if they did, they would have converted it into more easily portable silver or gold bullion. 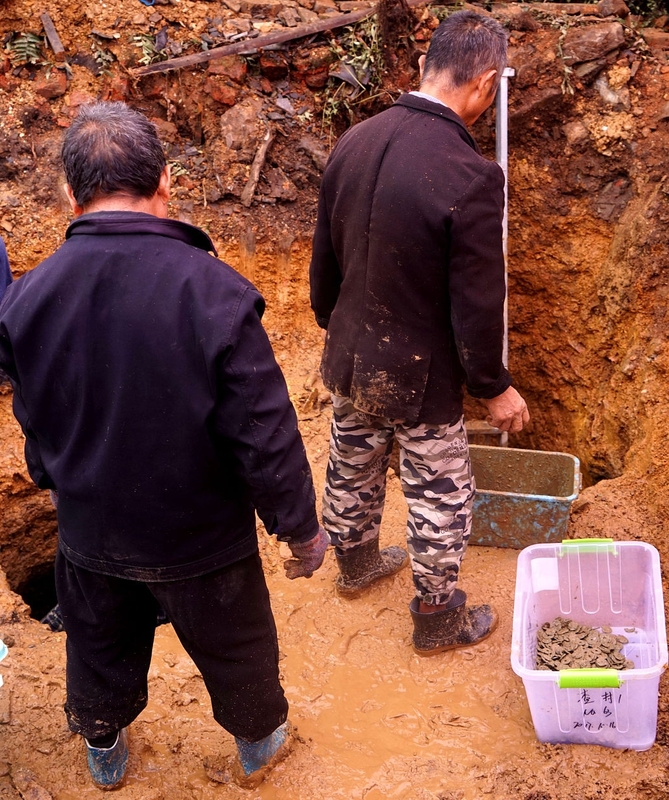 According to Fuliang County Museum Director Feng Ruqin, the coins were probably stashed by a private organization or a bank. The excavation is over now and all three cellars have been backfilled for their protection. Conservators and researchers now have to commence the daunting task of cleaning, derusting, classifying weighing, cataloging and studying 5.6 metric tons of coins. The process is expected to take at least two or three years. This entry was posted on Wednesday, January 17th, 2018 at 10:40 PM	and is filed under Medieval. You can follow any responses to this entry through the RSS 2.0 feed. You can skip to the end and leave a response. Pinging is currently not allowed. I wonder when the local folklore story started? After the coins were found? If before how come no one found the time to dig around in the past? I’m not one for picking people up before they fall down, but a metric tonne (1000Kg, 2204lb) is within a few pounds of an imperial (long)ton – (1018Kg,2240lb). Different, of course, to a short ton (907Kg 2000lb)as use in the US. Pedantry episode over . . .
Jannie, to get away with 1145.8867 lbs of ‘copper’, i.e. (Ahtna: tsedi): Buryat: зэд (zed), Tuvan: чес (čäs), Svan: ჩეი̄ (čeī), Mongolian: зэс (zes) -or NOT to get away with it, and being sliced into pieces instead- can easily make quite a heavy difference. Taking into account that “Zaster” (Rotwelsch language) is suppose to mean ‘money’ or ‘iron’, I am beginning to think now that it means in fact ‘money’ or ‘copper‘. I mean, not even in China would they make coins from iron, or would they ? Until they have cleaned the coins, whether it is a long ton, metric ton or tonne, or even any other ton, is probably immaterial, especially since 5.6 will lie somewhere between approximately 5.55 and 5.65. Still, I wonder whether living over such a mass of copper was like permanently wearing one of those rheumatism bracelets, or indeed tended to attract local lightning? And my wife complains about a bucket of pennies I have in the basement!